Deepak Chopra and Freestyle Battles… Oh My! Broadway World just announced a one-month extension for Rap Guide to Consciousness at the Soho Playhouse, with off-Broadway shows added until May 31st. If you have a social media channel, please share the good news! And here’s the official press release for regular old unsocial media. In other surprising news, I have been entering freestyle competitions off and on since moving to New York in 2011, and on Monday night I finally won a trophy for rapping. Not science rapping, just rapping. 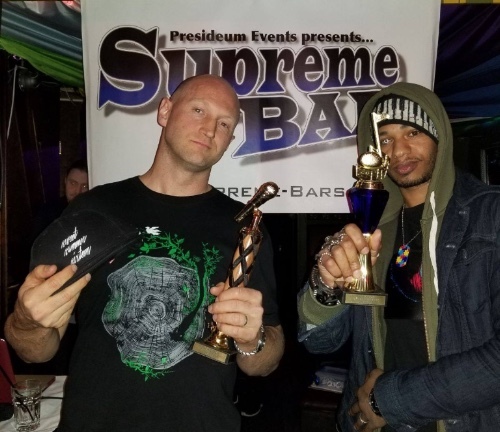 Check out the post from Supreme Bars, announcing their April 2018 champion rapper and producer. I’m not sure how newsworthy this fact is, but the rappers in New York are formidable and I’ve been into freestyle for a long time, entered my first battle in 2002, and still love the thrill and sport of it, so indulge me a victory lap. On a slightly different note, Deepak Chopra seems to like my latest song “Heaven’s Gate“, which samples his voice in the chorus. He tweeted it out to his followers and even agreed to join me at the show for a talkback and audience Q&A on May 13th, which will be interesting since our views on the nature of mind are clearly divergent. Still, if I can get both Dan Dennett and Deepak to rock out to the same show, the overall harmony of the world must be increasing. Finally, tomorrow night’s show is going super meta. A research group called Lab of Misfits is studying the effects of live performance on the brain, and tomorrow they will have a whole row of audience members hooked up to EEG brain scanners during my performance, capturing the real-time activity of human brains experiencing brain science-themed rap. I’m not sure how long before we can release the results of the study, but I for one am fascinated to see what my show does to brains. Most nights I only get to see and hear the external behavioural effects, which is already reward enough to keep me going.